I went back to Northside Social in Falls Church City (since I was too hung over to record it on New Year’s Day) and had a triple oat milk latte in my personal travel mug cuz one can do that at a cafe like NSS-FC. I also recently received my official #coffeeneuring2018 patch, my 5th year of completing that challenge. @CGBanimal graced coffee with her presence and we discussed my secret recipe for morning oat parfaits. I then rode to pick up some art in Farmington (near Shirlington) and stopped at Best Buns for a hot Passion tea in the same travel mug (which they kindly rinsed out with hot water), along with a chocolate-banana muffin. While there, I noticed for the first time that the mural in the dining room next door includes a woman and a bicycle at an outdoor cafe. Last edited by Boomer2U; 01-08-2019 at 10:54 PM. #FS2019coffeeride side bet #9 (& #10 & #11 below), a Cubano at Bourbon Coffee on L St, NW. I went by two more shops, Dolcezza and Wydown Coffee Bar, both on 14th St, NW, but I didn't have my list with me and missed them. Last edited by consularrider; 01-08-2019 at 11:27 AM. #FS2019coffeeride side bet #10 a Cubano at the Colada Shop on T St, NW. #FS2019coffeeride side bet #11, a cortado at The Royal on Florida Ave, NW. You'll have to go back! 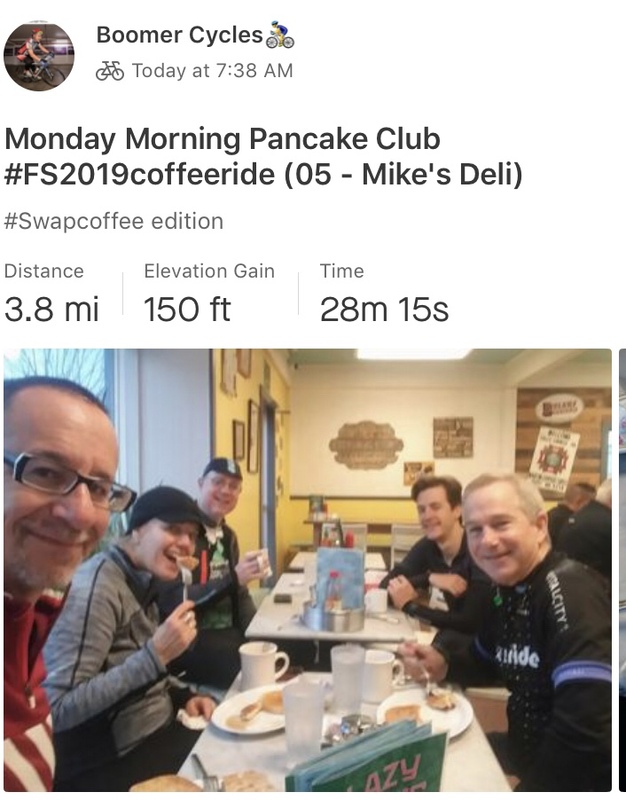 I joined the #MMPC regulars for breakfast before journeying abroad for work, and had the bottomless cup of coffee at Mike’s Deli along with 2 eggs (over easy), pancakes and whole wheat toast. The coffee was a truly unremarkable drip that I believe should be eligible as a tie breaker “swamp” coffee should I find myself in that situation at the end of this year’s FS competition. Otherwise it’s the best 50 cent deal in town if don’t care what your coffee tastes like. Last edited by Boomer2U; 01-08-2019 at 10:26 PM. Yep, still have three days to do the remaining four. Hopefully I won't get blown of the bridges crossing the Potomac. Last edited by consularrider; 01-09-2019 at 02:17 PM. Google really wants you to go in the alley entrance at Qualia Coffee on Georgia Ave, NW, even with a front door and two bike racks out front. I enjoyed a cortado anyway. #FS2019coffeeride side bet #13, the Wydown Coffee Bar and another cortado.